Considering the importance of psychological factors in learners' reading abilities, this study examines the relationship between flow, emotioncy, and reading comprehension. To this end, 238 upper-intermediate and advanced English as a Foreign Language (EFL) learners were asked to take four tests of reading comprehension along with flow and emotioncy scales. Rasch analysis, confirmatory factor analysis (CFA), and correlations were used to analyse the data. The results demonstrated that emotioncy has a significant relationship with flow in three out of four and with reading comprehension in one out of four used topics. Furthermore, it was revealed that emotioncy and flow are predictors of reading comprehension, and emotioncy has a distal effect on reading comprehension. In the end, implications are provided in the context of EFL teaching. Reading comprehension has received much attention from researchers in the past few decades. In the academic context, reading comprehension is recognised as the most important skill for language learners (Carrell, 1989). Reading comprehension is a complex mental process which is affected by the interplay of many factors, of which some are related to the text itself, such as text difficulty and text structure, and some are related to the readers' cognition and emotions. One of the cognitive variables hypothesised to affect reading comprehension is the flow state. The theory of flow is a distinct way of understanding motivation. In the past, extrinsically rewarding tasks were under primary focus, while flow theory brought about the significance of intrinsic motivation and self-rewarding activities. This theory claims that when people are engaged with an intrinsically rewarding activity, they push themselves to higher levels of performance (Csikszentmihalyi, 1990). The conditions under which flow occurs can also be found in the context of second and foreign language learning (Egbert, 2003). The other variable hypothesised to affect flow state and reading comprehension in this study is the concept of emotioncy. A recent concept for dealing with sense-induced emotions in the context of learning is the idea of emotioncy (emotion + frequency) introduced by Pishghadam, Tabatabaeyan and Navari (2013). The concept gives weight to the emotions evoked by the senses which can relativise cognition (Pishghadam & Abbasnejad, 2016). Based on the idea of emotioncy, learners may carry different levels of emotions toward various subjects which can affect the degree of their involvement in the activity at hand (e.g., a reading comprehension task). Hence, higher levels of emotioncy toward a subject may result in more involvement and more chances for flow to occur. In this way, emotionalising language can lead to the occurrence of flow which is a desired and optimal state for language learners. Also, higher levels of emotioncy towards the topic of a reading comprehension test can affect readers' performance. Therefore, this study examines the role of topic emotioncy in the occurrence of flow and its resulting role in test performance. In the following sections, a brief account of the background of the study is provided. By taking the importance of reading comprehension into consideration, the need for a focus on the testing aspect of this skill becomes evident. With regard to the variations in language test performance, Bachman (1990) enumerated three types of sources of variability: (a) variations due to differences in testing methods and tasks; (b) variations due to individual differences in language abilities, processing strategies and personal characteristics; and (c) variations due to random factors such as mental alertness, testing environment, etc. As for the individual differences which are the focus of the present study, cultural background, background knowledge, cognitive characteristics (e.g. field dependence/independence and ambiguity tolerance) native language, ethnicity, gender, and age can all result in variations in test performance (Bachman, 1990). With regard to the individual differences, one well-established theory related to prior knowledge that test takers bring to a reading comprehension test is the schema theory first introduced by Bartlett (1932), which accounts for how information is restored in memory. One of the key insights of this theory is the role of the readers' background knowledge, topic familiarity, and their interactions with text comprehension which have resulted in an extensive literature (e.g., Anderson & Pearson, 1984; Kintsch & van Dijk, 1978; Mohammed & Swales, 1984; Ridgway, 1997; Wilson & Anderson, 1986). Also, it has been suggested that partial or inaccurate prior knowledge, or knowledge that contradicts with information in the text can interfere with or even hinder comprehension (Carrell & Eisterhold, 1983; Lipson, 1984; Reynolds, Taylor, Steffensen, Shirey & Anderson, 1982). Johnston (1984) explored the role of prior knowledge from the test bias view point. His findings indicated that regardless of intelligence and other variables, prior knowledge influenced the comprehension of the chosen texts and chosen topics were proved to be biased for different groups of participants. There is also a considerable number of studies about cultural familiarity and its role in comprehension (e.g., Carrell, 1984; Johnson, 1981; Pritchard, 1990; Steffensen, Joag-Dev & Anderson, 1979). Among recent studies regarding the culture-specific aspect of the schema theory, Alptekin (2006) argued that text-based and instrument-based aspects have not received much attention. He further argued that "familiar life-like" texts provide opportunities for readers to activate their abstract knowledge (Alptekin, 2006, p. 496). Moreover, he explained that to test cultural knowledge, two equivalent texts based on readability formulas have always been used; however, readers' emotions and experiences that they bring to the text are ignored. Hence, in order to test the effect of cultural familiarity in inferential comprehension, Alptekin (2006) used two versions of a short story - the original version and a nativised version - to test participants' literal and inferential comprehension. Results of the study indicated that cultural background knowledge facilitated participants' inferential understanding of the text, but it did not affect their literal understanding. Csikszentmihalyi (1975) introduced the concept of flow at a time when behaviouristic psychology emphasised the crucial role of extrinsic motivation expressing that relying only on external rewards can "conceal real dangers" (p.3). While flow has been developed as a theory of motivation and engagement in the field of psychology, its usefulness in the field of education is considered to be undeniable (Schmidt, Shernoff & Csikszentmihalyi, 2007). Most of the conditions that are necessary for the occurrence of flow can be found in classroom environments. Recent research findings in American and Italian schools have suggested that while the challenge and skill conditions are often present in schools, students do not feel a deep concentration, involvement, and enjoyment that typically follow from these conditions (Delle Fave, Bassi & Massimini, 2002; Schmidt, et al., 2007). Flow theory in the context of education provides a basis for knowledge regarding how students might become more engaged in their learning. There is, however, much work remaining to be done in this field to fully understand the complexities of flow's role in educational processes. 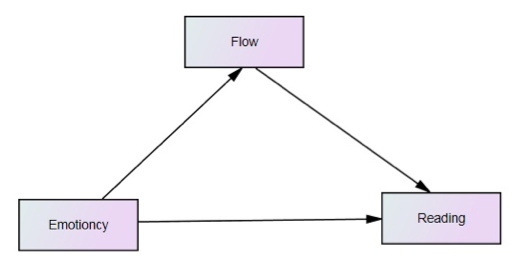 Although scholars have conducted research into the existence of flow in an educational context, for language acquisition the related literature is limited. Egbert (2003) hypothesised a relationship between flow and language learning, holding that based on the learners' characteristics and the learning environment, flow is likely to happen, and in return it can result in optimal experiences and bring about engaged, motivated, and focused learners. Here, the target language tasks play an important role. With regard to course design and task requirements, Guan (2013) mentioned that pre-task preparation could help students have clear objectives and goals. Also, translation tasks must be chosen regarding the challenge/skill balance to minimise anxiety and fear. Choosing interesting topics for translation and improving an autonomy-supporting environment can enhance the optimal experience for students. Finally, teachers must choose translation tasks which are related to students' lives and in which they have an interest. The idea of emotioncy which was first introduced by Pishghadam, Tabatabaeyan, et al (2013) was largely inspired by Greenspan and his developmental, individual-differences, relationship-based (DIR) model of language acquisition (Greenspan & Shanker, 2004). Inspired by Greenspan's model, emotion-based language instruction (EBLI) is a new approach to language learning which is based on creating effective emotional relationships with students and emotionalising language (Pishghadam, Adamson & Shayesteh, 2013). According to the EBLI, children learn their first language in an emotional context and by developing specific emotions toward different words; hence, learning the first language appears to be an easier process. Moreover, in the second/foreign language learning process the learner needs to create a link between the words of the second/foreign and the first language. If the learner faces a word toward which they carry little or no emotion, learning the word is said to be more difficult. Furthermore, based on the EBLI, words carry different levels of emotion for different individuals which are referred to as emotioncy (Pishghadam, Adamson, et al., 2013). Pishghadam, Adamson, et al. (2013) argued that emotionalisation goes beyond Piaget's schema theory; as in this theory the role of prior knowledge is emphasised, while in emotionalisation prior emotion comes under focus. Also, in contrast with Krashen's (i+1) theory which states that in order to be fully acquirable, the input must be one level beyond the current level of the learners, Pishghadam, Adamson, et al, (2013) believed that the majority of the input must be words with which the learner has an already-established emotional relationship and they are slightly above their level of emotioncy. In order to extend the earlier work on emotioncy, Pishghadam and Shayesteh (2016) explored the application of emotioncy to vocabulary teaching in order to find out if learners' level of emotioncy and their socio-economic background are linked. With regard to the level of emotioncy, their results indicated that the students with high socio-economic background enjoyed the highest levels of emotioncy and they also outperformed the students in mid and low groups. While, students with low socio-economic background scored the lowest regarding their levels of emotioncy and their immediate and delayed vocabulary tests (Pishghadam & Shayesteh, 2016). 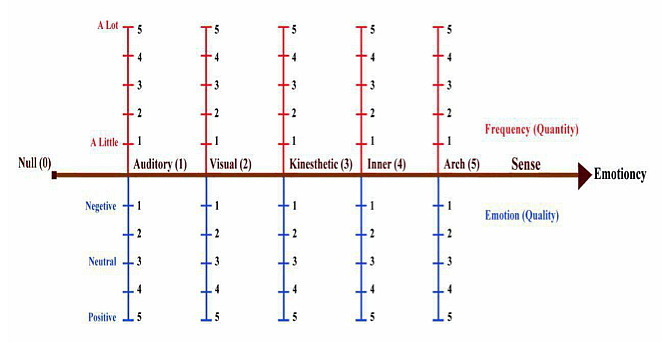 Later, in order to further develop the concept, Pishghadam, Jajarmi and Shayesteh (2016) labeled different types of emotioncy as null emotioncy (0), auditory emotioncy (1), visual emotioncy (2), kinesthetic emotioncy (3), inner emotioncy (4), and arch emotioncy (5) (Table 1). Null emotioncy When an individual has not seen, heard about or experienced an object or concept. Auditory emotioncy When an individual has merely heard about an object or concept. Visual emotioncy When an individual has both heard about and seen the object. Kinesthetic emotioncy When an individual has heard about, seen, or touched the real object. Inner emotioncy When an individual has directly experienced the word/concept. Arch emotioncy When an individual has deeply done research to get additional information. Adapted from Pishghadam, Jajarmi, et al (2016). In this regard, Pishghadam (2016) devised a six-level emotioncy matrix (Figure 1), which is labeled with different levels of emotioncy that further clarifies the concept. The figure illustrates that emotioncy can range from Avolvement (null emotioncy), to Exvolvement (auditory, visual and kinesthetic emotioncies), and finally to Involvement (inner and arch emotioncies). Figure 1: Emotioncy levels. Adapted from Pishghadam (2016b). Moreover, Pishghadam, Shayesteh and Rahmani (2016) explored the role of emotionalisation and contextualisation in teacher success by hypothesising that teachers who consider learners' cognitive and affective experiences are more successful than the ones who are devoted to conventional routines in language teaching. In another study, Pishghadam, Baghaei and Seyednozadi (2016) analysed emotioncy as a potential source of test bias and hypothesised that individuals have different levels of emotioncy toward words which may systematically affect their test performance, resulting in test bias. The results obtained from this study indicated that the ones who carried higher levels of emotioncy toward words outperformed the ones with low levels of emotioncy. They also mentioned that emotioncy as a source of test bias has a dynamic nature, while other sources such as age and gender are static. Further, Pishghadam, Jajarmi, et al (2016) mentioned that exvolved learners (auditory, visual and kinesthetic emotioncies) experience distal emotions which are far from reality and they process the input superficially, while involved learners (inner and arch emotioncies) enjoy proximal emotions and they are engaged in a more in-depth analysis of the input. Furthermore, Pishghadam (2016b) examined the effect of emotioncy on willingness to communicate by hypothesising that the higher the level of emotioncy, the higher the level of willingness to communicate. In order to test emotioncy, a new metric was proposed by Pishghadam (2016b), which consists of two parts: sense and emotion. Sense refers to the amount of exposure to a concept, and the emotion part refers to the valence (negative, neutral and positive) of emotions (Figure 2). The results of this study (Pishghadam, 2016b) indicated that emotioncy, extraversion, anxiety, and willingness to communicate are moderately related and with regard to emotioncy, it was revealed that the higher the level of emotioncy toward a subject, the more likely the learner is willing to communicate about that subject. This shows that senses can influence motivation, which can be called sensory motivation. Finally, Pishghadam (2016a) introduced the educational emotioncy pyramid (see Figure 3) to emphasise the role of senses in education. In the realm of education, students are in a state of disequilibrium and may not have the slightest clue of course requirements at the onset of entering a classroom (null emotioncy). Their first encounters with learning come through the sense of hearing when teachers initiate their training by broaching the subject through talking about it. The auditory sense is therefore our primordial source of information in classrooms. The pyramid shows that the greatest amount of information in classrooms is absorbed through hearing. Auditory input such as lectures constitute a considerable portion of class time. However, teachers usually transcend this level by trying to engage the students' sense of sight alongside hearing. PowerPoint slides have thus come to be the most common way of injecting classrooms with audio-visual information during lectures. Meanwhile, having the sense of touch alongside vision and hearing can facilitate the process of learning. Hence, through incorporating activities which entangle the senses of touch, movement, sight, and hearing, such as role plays, teachers attempt to create a contrived experience for students. Moreover, in the inner emotioncy level, all of the senses (whatsoever the number is) are tapped upon simultaneously, providing the students with the opportunity to have a real experience that overlaps with reality. 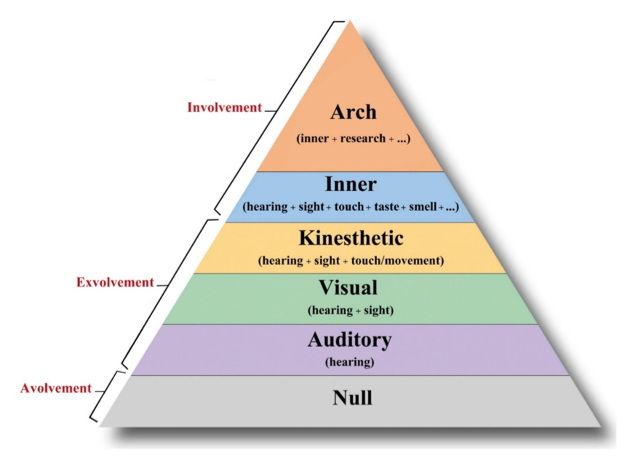 Finally, arch emotioncy is said to be the pinnacle of ones' sensory experiences as it betters the understanding of a concept by doing research on it and exploring its different facets. Drawing a distinction between inner and arch emotioncies seems to be of utmost importance. In inner emotioncy students form their first real meaning of something by experiencing the nature of something, while in arch emotioncy they become familiar with multiple layers of meanings. Is there any significant relationship between the levels of emotioncy and occurrence of the flow state? Is there any significant relationship between the levels of emotioncy and learners' reading comprehension ability? Does flow significantly mediate the relation between emotioncy and reading? A total of 238 EFL students participated in this study, including 164 females (68.9%), 62 males (26.1%), and 12 (5%) gender not disclosed. The participants were all studying English in different English language institutes in Mashhad (a city in Iran). In order to attain homogeneity, the participants were chosen from upper intermediate and advanced levels, and outliers were identified and omitted using Z score for the participants' reading comprehension scores. The age range of the participants was between 11 and 36, with mean 20.76 years (SD=4.97). In fact, language proficiency was controlled at the expense of the age, which was not the concern of this study. Confirmatory factor analysis (CFA) was used to check the validity of the scale. The goodness of fit indices showed adequate fit to the data. As for the flow state, Engeser and Rheinberg's (2008) Flow Short Scale (FSS) was used. It comprises 10 items on 7 point Likert scales. The questionnaire, originally composed in English, was translated into Persian by the researchers, to increase the return rate. It was piloted with eight EFL learners and back-translated into Persian by an expert in translation. As for the four flow scales related to each reading test, CFA was used and the fit indices were within the acceptable range. Therefore, the flow scale attained validity. To test participants' reading comprehension, four different topics were chosen: sushi, guitar, Easter day and Persepolis. The rationale behind choosing these topics was to ensure that the desired wide range of emotioncy among participants was attained. In the context of Iran, sushi is not considered to be popular by many people, and it is served in very few restaurants. Also, Easter day is a Christian holiday while Iranian participants come from an Islamic context; hence, it was expected that these two topics would range lower on the continuum of emotioncy. Persepolis is a historical monument in Iran which is very famous and popular, and the guitar is considered to be a well-known musical instrument in Iran; hence, these two topics were expected to range higher on the continuum of emotioncy. Four English text passages each with an approximate length of 300 words were chosen, and five four-item multiple choice questions were designed for each of them. All items were designed based on the reading comprehension sub-skills proposed by Spearritt (1972). Rasch measurement was used to check the unidimensionality of the four reading tests. All items were within the acceptable range. Also, to check for the homogeneity in text difficulty, the Gunning Fog readability scale was used (Gunning, 1968). The readability scores ranged from 10.6 to 14.3 and based on this formula all the texts were located in the same group of text difficulty. The researchers contacted the institutes' supervisors and after gaining their permission, the questionnaires were given to students during regular class times. Before the administration of the questionnaires, the participants were informed that their participation was voluntary and no names would be used in the study. All the questionnaires were completed in one session. It took approximately 40 minutes to complete the questionnaires. CFA was used to validate the scales, and Rasch analysis was conducted to validate the reading comprehension tests. Results can be seen in the Appendices. Internal consistency reliability was measured by Cronbach's alpha coefficient. Finally, mediation analysis was used to check for any indirect effects among variables. To examine the validity of the flow scale, CFA was utilised. The goodness of fit indices were used to check the model fit (Table 2). As we assessed flow for four reading tests, each flow scale was examined separately. Factor loadings can be seen in Appendix B. As Table 2 indicates, all the fit indices were acceptable. Moreover, to assure the reliability of the scales, Cronbach's alpha was calculated (Table 3). The flow scale attained high reliability for all four reading tests. To examine the validity of the emotioncy scale, a model based on the two dimensions of emotioncy (i.e., frequency and emotion) for the four subjects was proposed. CFA was used to check the validity of the scale. Factor loadings can be seen in Appendix B. The goodness of fit indices showed adequate fit to the data (Table 4). Moreover, Cronbach's alpha was used to check the reliability of the scale. It was .71 for this scale assuring acceptable reliability. The relation between each emotioncy score and its flow scale were examined (Table 5). There is a significant positive correlation between emotioncy and flow for guitar (r = .28, p < .05), Persepolis (r = .18, p < .05), and Easter (r = .21, p < .05). No significant correlation was found between emotioncy and flow for sushi (r = .05, p > .05). Results for examining the relation between participants' emotioncy score and their reading test score are given in Table 6. There is a positive correlation between emotioncy and flow for Persepolis (r = .18, p < .05), but no significant correlations were found between emotioncy and flow for sushi (r = .10, p > .05), guitar (r = .06, p > .05), and Easter (r = .02, p > .05). 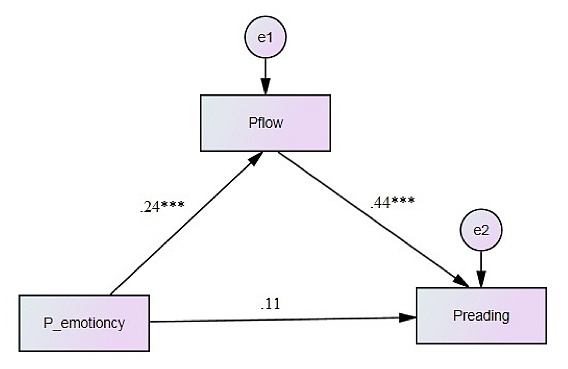 In order to examine the role of flow as a mediator between emotioncy and reading, a model was proposed and tested for the four topics (Figure 4). 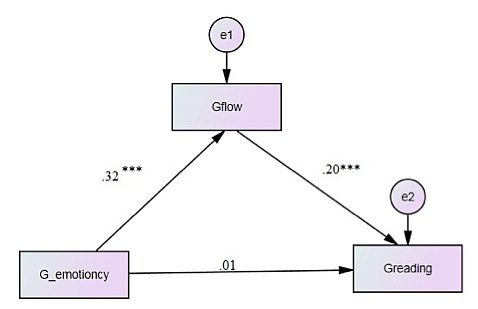 Based on this model, emotioncy predicts flow and reading. Moreover, flow is a predictor of reading comprehension. The goodness of fit indices for all four models can be seen in Table 7. First, the proposed model was tested for sushi (Figure 5). The goodness of fit indices were very low for this model. No significant relation was found between the variables. Therefore, the model cannot be considered acceptable. Then, the proposed model was tested for guitar (Figure 6). The goodness of fit indices were all acceptable. Emotioncy is a positive predictor of flow (β = .32, p < .05), and flow is a positive predictor of reading (β = .20, p < .05). However, emotioncy was not a significant predictor of reading. As emotioncy is related to flow, and flow is related to reading, the indirect effect of emotioncy on reading mediated through flow can be tested using mediational analysis. Mediation analysis with 1000 bootstrapped samples (random sampling with replacement) was performed. The bias-corrected bootstrap confidence interval showed that the mediation is significant between emotioncy and reading (β = .06, CI = .01-.59). In other words, emotioncy is indirectly related to reading through flow. Then, the proposed model was tested for Easter (Figure 7). The goodness of fit indices were all acceptable (see Table 7). Emotioncy is a positive predictor of flow (β = .25, p < .05), and flow is a positive predictor of reading (β = .26, p < .05). However, emotioncy was not a significant predictor of reading. Mediation analysis with 1000 bootstrapped samples was performed. The bias-corrected bootstrap confidence interval showed that the mediation is significant between emotioncy and reading (β = .06, CI = .02-.79). In other words, emotioncy is indirectly related to reading through flow. Finally, the proposed model was tested for Persepolis (Figure 8). The goodness of fit indices were all acceptable (see Table 7). Emotioncy is a positive predictor of flow (β = .24, p < .05), and flow is a positive predictor of reading (β = .44, p < .05). However, emotioncy was not a significant predictor of reading. Mediation analysis with 1000 bootstrapped samples was performed. The bias-corrected bootstrap confidence interval showed that the mediation is significant between emotioncy and reading (β = .10, CI = .03-.13). In other words, emotioncy is indirectly related to reading through flow. Given the significance of psychological factors in reading comprehension, this study examined the relationship between flow, emotioncy, and reading comprehension. The pertinent scales and tests were designed and validated, revealing that the constructs are associated with each other. One line of explanation for our results can be drawn from descriptive statistics. Most of the participants (77.7%) were in the exvolved group. Based on the concept of emotioncy (Pishghadam & Abbasnejad, 2017), when learners have heard about, have seen, or have touched the entity, they are located in the exvolved group, which means they merely know what that item is, or even have seen and touched it, but they do not have a direct experience of that entity or in other words, they have not been involved in it. It can be proposed that this lack of involvement can result in a lack of interest, and in turn hinder the occurrence of flow. These findings are in line with the findings that indicate partial or inaccurate prior knowledge about a text can hinder comprehension (Carrell & Eisterhold, 1983; Lipson, 1984; Reynolds, et al., 1982). Moreover, when learners are not involved in an entity, they may have inaccurate or misinterpreted feelings about that entity. This inaccuracy may later be in contradiction with what they encounter in the text, and this can be the cause for losing optimal concentration and interest. On the other hand, with regard to the avolved group, 30.3% of the participants were located in this group for the topic of Easter day. This is while only 6.3% of the participants for sushi, 0.4% of the participants for Persepolis, and none of the participants for guitar were located in the avolved group. For the topic of Easter, it can be discussed that when learners are avolved in a topic, it means they have not even heard about it. Interestingly, they may also be likely to experience flow. It can be explained that lack of knowledge about something may create motivation or curiosity for the learner to read and find about it. This line of reasoning can be contrasted with the studies that explain how the lack of familiarity with the topic of a reading comprehension test can result in poor reading comprehension performance (e.g., Pulido, 2004a; 2004b). To discuss the results regarding the possible relationship between emotioncy and reading, it can be stated that the majority of the involved-type participants belonged to the group of Persepolis topic. When the students are more involved, their performance on the reading comprehension test is enhanced. About the other three topics, although emotioncy was shown to be indirectly related to reading comprehension, it was not shown to be a direct predictor of reading comprehension. It is arguable that the emotioncy scores are merely the participants' emotioncy toward the topics, and emotioncy toward a topic cannot necessarily be expanded to emotioncy toward a text. Hence, it is possible that emotioncy toward a text is the sum of emotioncy scores for all the words included in the text. To examine the role of emotioncy and flow as predictors of reading comprehension, a model was proposed and tested for the four topics using mediation analysis. Based on this model, emotioncy predicts flow and reading. Moreover, flow is a predictor of reading comprehension. Also, emotioncy was a positive predictor of flow, and flow was a positive predictor of reading comprehension. In this fashion, emotioncy is said to have a distal effect on reading comprehension ability through flow. In other words, the level of emotioncy contributed to the occurrence of flow, and occurrence of flow was contributory to participants' reading comprehension ability. The analysis revealed that when the level of emotioncy is higher, it can positively predict the occurrence of flow which is an optimal state for learning, and this optimal state can be a positive predictor of reading comprehension ability. A considerable body of literature is dedicated to the issue that how learners' individual differences and background knowledge toward the topic of the test can result in test bias (e.g., Brantmeier, 2003; Bügel & Buunk, 1996; Johnston, 1984; Pae, 2004). Topic familiarity and background knowledge have received much attention and were shown to be contributory to reading comprehension performance. In this study, it was indicated that as well as background knowledge, lack of knowledge can also enhance readers' performance. This was explained by the fact that being avolved or having no knowledge about a topic can result in curiosity and interest to gain knowledge. This interest can enhance attention and concentration and contribute to the occurrence of flow state which can result in higher performance on a reading comprehension test. It can be concluded that although topic familiarity and background knowledge are known to be possible sources of test bias, lack of knowledge toward a topic also needs to be taken into consideration when a test is checked for biases. As already mentioned, emotioncy is indirectly related to reading comprehension. It implies that when learners are involved or avolved in a topic, they may experience flow. This sense of engagement with a topic can enhance reading comprehension. This finding can be of help to material developers to design texts based on the emotioncy criterion. It means that reading texts can be chosen based on the sensory/emotional background of learners (Pishghadam, Zabetipour & Aminzade, 2016). It seems that within the notion of emotioncy, localisation is implied. Localisation by giving more weight to the norms and standards of the guest country emphasises the role of familiarity with the target culture. Teachers are required to be aware of the criterion in selecting the materials for teaching English in their own contexts. Since in this study a number of students from different ages were chosen, another study can be done with a more limited age range to come up with more exact results. Moreover, since the study was totally quantitative, a comprehensive picture was not drawn. Another study can be conducted qualitatively to explain the findings of the study in more details. The texts in this study were not specialised, requiring another study to be done on English for specific purposes (ESP) texts to examine the roles of emotioncy and flow in them. Finally, other studies can be conducted to explore the role of emotioncy with other topics to see whether the same results can be obtained. Anderson, R. C. & Pearson, P. D. (1984). A schema-theoretic view of basic processes in reading comprehension. In P. D. Pearson, R. Barr, M. L. Kamil & P. Mosenthal (Eds. ), The handbook of reading research (pp. 255-292). New York: Longman. Bond, T. & Fox, C. M. (2015). 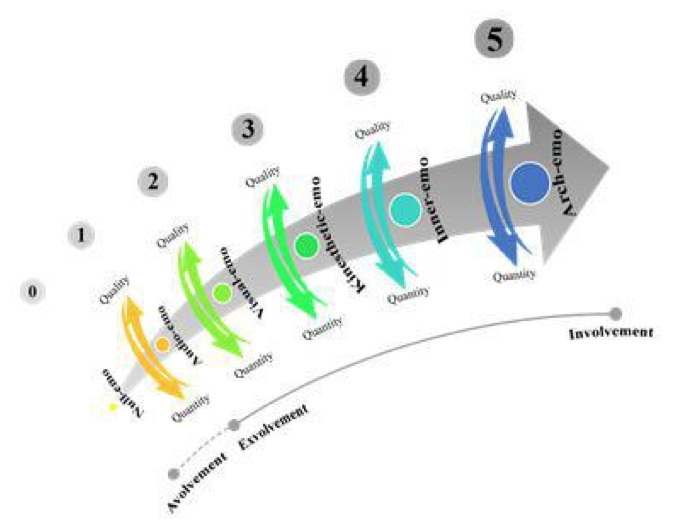 Applying the Rasch model: Fundamental measurement in the human sciences. Routledge. Brown, H. D. (2001). Teaching by principles: An interactive approach to language pedagogy. White Plains, NY: Pearson Education. Delle Fave, A., Bassi, M. & Massimini, F. (2002). Quality of experience and daily social context of Italian adolescents. In A. L. Comunian & U. P. Gielen (Eds. ), It's all about relationships (pp. 159-172). Lengerich: Pabst Science Publishers. Dörnyei, Z. (2001). Motivation strategies in the language classroom. Cambridge, UK: Cambridge University Press. Greenspan, S. I. & Shanker, S. (2004). The first idea: How symbols, language and intelligence evolved from our primate ancestors to modern humans. Boston: Da Capo Press Perseus Books. Gunning, R. (1968). The technique of clear writing (Rev. ed.). New York: McGraw-Hill. Linacre, J. M. (2009). Winsteps (Version 3.68) [Computer Software]. Beaverton, Oregon: Winsteps.com. Pishghadam, R. (2016b). Emotioncy, extraversion, and anxiety in willingness to communicate in English. In Proceedings 5th International Conference on Language, Education, and Innovation, London, 28 May. Pishghadam, R., Tabatabaeyan, M. S. & Navari, S. (2013). A critical and practical analysis of first language acquisition theories: The origin and development. Mashhad, Iran: Ferdowsi University of Mashhad. Schmidt, J. A., Shernoff, D. J. & Csikszentmihalyi, M. (2007). Individual and situational factors related to the experience of flow in adolescence: A multilevel approach. In A. D. Ong & M. van Dulmen, (Eds. ), The handbook of methods in positive psychology, pp 542-558. Oxford: Oxford University Press. Spiro, R. (1980). Constructive processes in prose comprehension and recall. In R. Spiro, B. Bruce & W. Brewer (Eds. ), Theoretical issues in reading comprehension (pp. 245-259). Hillsdale, NJ: Erlbaum. Wilson, P., & Anderson, R. C. (1986). What they don't know will hurt them: The role of prior knowledge in comprehension. In J. Orasanu (Ed. ), Reading comprehension: From research to practice (pp. 31-48). Hillsdale, NJ: Lawrence Erlbaum. Rasch measurement was used employing WINSTEPS software (Linacre, 2009) to check the unidimensionality of the four reading tests. Item separation index, person separation index, item reliability, person reliability, and infit statistics were used to check the reliability and validity of the reading tests. Each test is explained in detail as follows. For sushi reading, analysis of the items showed an item separation index of 5.63 with an item reliability of .97, and a person separation index of 2.94 with a person reliability of .89. Following Bond and Fox (2015), items which do not fit the Rasch model have infit mean square (MNSQ) indices outside the acceptable range of 0.70-1.30. As Appendix A, Table 1 indicates, all items lie within the acceptable ranging assuring unidimensionality of the test. For guitar reading, analysis of the items showed an item separation index of 6.68 with an item reliability of .98, and a person separation index of 2.39 with a person reliability of .87. Following Bond and Fox (2015), items which do not fit the Rasch model have infit mean square (MNSQ) indices outside the acceptable range of 0.70-1.30. As Appendix A, Table 2 indicates, all items lie within the acceptable ranging assuring unidimensionality of the test. For Easter reading, analysis of the items showed an item separation index of 5.23 with an item reliability of .97, and a person separation index of 3.15 with a person reliability of .91. Following Bond and Fox (2015), items which do not fit the Rasch model have infit mean square (MNSQ) indices outside the acceptable range of 0.70-1.30. As Appendix A, Table 3 indicates, all items lie within the acceptable ranging assuring unidimensionality of the test. For Persepolis reading, analysis of the items showed an item separation index of 6.58 with an item reliability of .98, and a person separation index of 3.25 with a person reliability of .91. Following Bond and Fox (2015), items which do not fit the Rasch model have infit mean square (MNSQ) indices outside the acceptable range of 0.70-1.30. As Appendix A, Table 4 indicates, all items lie within the acceptable ranging assuring unidimensionality of the test. Authors: Leila Shahian holds an MA degree in Teaching English as a Foreign Language (TEFL) from Ferdowsi University of Mashhad, Iran. Her research interests include psychology of language teaching and learning, research methodology, and sociolinguistics. Dr Reza Pishghadam (corresponding author) is a professor of language education and a courtesy professor of educational psychology at Ferdowsi University of Mashhad, Iran. In 2010, he was classified as the distinguished researcher of humanities in Iran. In 2014, he also received the distinguished professor award from Ferdowsi Academic Foundation, Iran. Dr Gholam Hassan Khajavy is an assistant professor in language education at University of Bojnord, Iran. His research interests include psychology of language learning and teaching and research methodology. He has published in journals such as TESOL Quarterly, Journal of Language and Social Psychology, and Learning and Individual Differences.